Our Pure Joy soy candles are all natural and scented with carefully chosen organic essential oils. We love their soft creamy appearance! 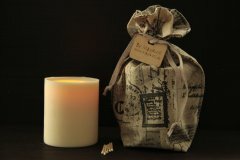 All our candles are made only with ECO Soy and ECO wicks and naturally only with essential oils. 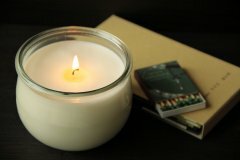 -All natural soy candles like ours are made from 100% pure soybeans and do not require chemicals to scent them. 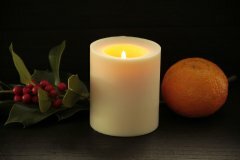 -Soy candles are non-toxic and much healthier than paraffin candles. -Soy candles produce a lot less soot than paraffin candles. -Soy candles burn 50% longer than regular candles. Soy burns very clean and gives a very clean scent. And because of the lower melting point of soy wax, there is more liquid wax around the wick than in a paraffin candle. It is from this liquid wax pool that the essential oils evaporate and scent your home and from a bigger vax pool you get a stronger scent. The excess wax on the sides of the tulipe glass is easy to remove with warm water and soap and there is no doubt you'll find a use for this nice bonbonier.